Plan, Package and Post Your Data! 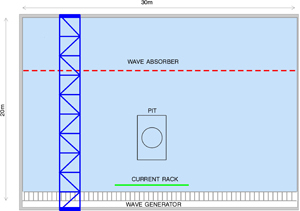 DHIs Offshore Wave Basin is 20 m long and 30 m wide with an overall depth of 3 m and a 12 m pit. Short-crested (3D) waves and swell are generated by 60 individually controlled flaps. A parabolic wave absorber located opposite the wavemakers minimizes reflections. Practically any wave spectrum and combination of wave spectra may be generated. 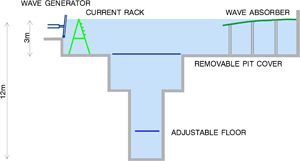 Current is generated in the basin using a technique of entrainment. 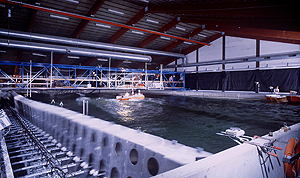 Water is pumped through high-pressure nozzles, located in a rack in front of the wave generators..
Wind Load on vessels or structures can be simulated by computer-controlled wind fans. The HYDRALAB project is funded by the EU Horizon 2020 Research and Innovation Programme under Grant Agreement number 654110. Copyright © 2000-2019 HYDRALAB+. All rights reserved.